The Great Barrier Reef is one of the most incredible living things on this planet. It is also the largest living thing on Earth and can actually be seen from space. Yet thanks to our species, the reef is struggling to stay alive. Tourism, pollution, and species that actually feed on coral have all contributed to the Great Barrier Reef’s decline in recent years. However, the biggest thing threatening the reef is by far climate change that has caused the ocean temperatures to rise several degrees. While a few degrees doesn’t seem like a big deal, it has been disastrous for the Great Barrier Reef as the coral can only survive in water that’s within a narrow temperature range. When sea temperatures rise above that range, it leads to a process that scientists call coral bleaching. When coral in the reef is alive and healthy, it is colorful and teeming with life. However, when exposed to warmer waters, it causes the reef’s coral to excrete algae that live within its tissues. The process leaves the coral completely white, which is why it’s called coral bleaching. Coral bleaching is so disastrous to the life of the reef is because the coral has a symbiotic relationship with the algae. The coral gets about 90 percent of its energy from the algae. Without it, the coral simply can’t survive. Sadly, there have been several coral bleaching events in recent years. According to scientists who study the Great Barrier Reef, several coral bleaching events occurred in 2016 and 2017. During that time, about half of Australia’s natural wonder died off. Without intervention, it’s likely that the reef will continue at this alarming pace and that all the coral will die. In 2018, data estimates that the total coral cover on the reef has decreased to just 14 percent. In recent years, scientists have been working around the clock trying to come up with ways to slow that pace as well as try to save the reef before it’s too late. Originally, researchers in Australia decided to try to target and decrease the population of crown-of-thorns starfish, a venomous species of starfish that actually feeds on the coral. Several outbreaks of the starfish over the past several years has devastated large tracts of the reef. Matthew Dunbabin, an engineering and robotics professor at the Queensland University of Technology in Brisbane, Australia, built a special underwater robot to keep the population under control. The robot, called the RangerBot, has a vision system to allow it to navigate in the water and avoid obstacles. As it patrols the reef, it looks out for and identifies crown-of-thorns starfish. After positive identification, the RangerBot then administers the starfish with a lethal injection that doesn’t affect anything else on the reef. While the RangerBot was a start, experts knew they still had to do more to combat the biggest threat to the reef. So Dunbabin started working to transform the RangerBot to serve a very different purpose with the help of Peter Harrison, director of the Marine Ecology Research Centre at Southern Cross University. Harrison had developed a plan to deliver coral babies to bleached areas of the reef. “I first thought about the larval restoration concept some decades ago when I was part of the team that discovered the mass coral spawning phenomenon on the Great Barrier Reef in the early 1980s,” Harrison told Nexus Media about his plan to help restore the reef. “The reduced number of corals means we’ve lost the ability for coral to provide enough larvae to settle and restore these communities quickly,” Harrison told NBC News. Over the years, Harrison worked and tested out different techniques for mass spawn capture and larval rearing. However, he needed help spreading the baby coral. 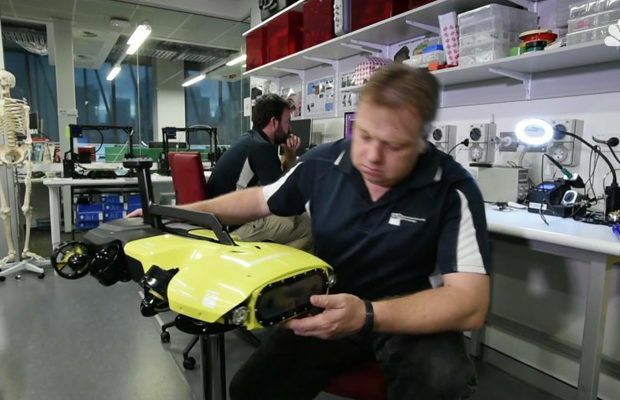 “One aspect that I still wanted to develop further was a more efficient larval delivery process onto the damaged reef areas, and so the LarvalBot concept developed from discussions with Matt,” Harrison said. After tweaking the RangerBot, Dunbabin managed to make the LarvalBot, a similar aquatic robot that would be able to distribute the coral babies on a large scale. “There are many pressures on the Great Barrier Reef. The two latest coral bleaching events had a significant impact on its health,” Dunbabin told Red Bull. “This project is a first intervention to help restore coral reefs in heavily impacted areas, and ensure biodiversity and functioning ecosystems,” Dunbabin explained. “The idea here is to use an automated technique that allows us to target delivery of the larvae into damaged reef systems and increase the efficiency that new coral communities can be generated,” Harrison said about their joint effort. In November of 2018, the team put their plan into action. The group collected hundreds of millions of coral spawn from unbleached areas of the reef. They then reared the spawn into baby corals in a floating enclosure on the reef. The project is particularly promising because the larvae are considered heat resistant. The larvae came from coral that survived the deadly coral bleaching events in 2016, 2017, and 2018. Hopefully, this will mean they could survive and thrive in warmer waters. “These surviving larvae are likely to have greater ability to withstand heat stress as they survive and grow,” Harrison said.